Corfu is so darn charming! I felt the most of that European charm in Corfu than anywhere else in Greece. I knew that Corfu is somewhat different from other Greek cities. Later on I found out that Corfu never fell under the Ottoman oppression making their influences distinctive from the rest of Greece. We went here during winter when tourists are not all over the place. Then again, we traveled to different parts in Greece sequentially, and still I found Corfu to be the most temperate. We really missed a lot of beautiful locations in Corfu given that we went there off season. We tried to go and see one beach destination, but it was so dead and everything’s closed that we didn’t even get to explore it. We only saw glimpses of it from the bus. But of course I (we) can get really stubborn when it comes to travel exploration. We walked an extra mile to taste a bit of Greece’s pristine waters. With time on our hands, we mainly circled around The Old Town. We visited the Old Fortress. We climbed the top all the way to the lighthouse. There, we got a bird’s eye view of the city center. We also took the bus and got to Achilleion. I’ll save that on a later post. Our hotel was conveniently near the Vlacherna Monastery. Granted we came here during Winter, but I was still completely charmed by it. What more if it was during summer season? Tell me, do you have any good off season travels? I love Greece! Crete, is probably my favorite island. Especially the parts that aren’t too touristy..
That must of been an unforgettable experience! Wow, your artistry in these photographs is such a pleasure, rommel. Thanks so much for taking on this breathtaking trip to Corfu. Every photo is a story, I espec. like the solo man in the boat surrounded by blue. Thanks for the kind words. That photo is getting quite a compliment. Rommel, you definitely fell in love with Greece. Even from the different part of the World you still write lovely articles about Beautiful country. I love these off season pictures. I do. I really really really do. I’m with you. I’d go back there in a heartbeat. One of my favourite places. Thanks for the post and memories ! Nice to know you’ve been too. Thanks for the comment and visit. I love my country and especially the Greek islands,dear Rommel,but I love it more through your lense and your glorious photos.You impressively displayed Kerkyra’s long history and culture blended with cerulean seas and verdant rocks.Thank you,my friend. Ahihihi …. Thanks for the beautiful verses. I actually love seeing your comment pics. It lets me know how others “see” the things I’ve seen. When you travel off season you see things and talk to locals in a way you never would during high season. Crocus peaking through the snow in London parks, hotel owner’s inviting you to their table in their dining room in Ireland, spending an hour talking to locals in the shops in Rome. Experiencing 15 straight days of (light)snow in Poland. January and February are the best time of the year to travel in Europe. Love your photos. I can never tire of Corfu. Thanks for the memory nudge! It’s gonna be etch to memory for me too. Have you been to Hydra? No but I saw your previous post and I am tempted. This year I return to the Cyclades after 5 years away! How do they get the water so blue? Greek has the best waters. Such pleasure to have lived there for a year. Btw, even i can’t resist touching the water even in winters! Ow, there was actually one person swimming on one of the areas I’ve shown here. I guess one can’t really resist to dive in those beautiful inviting waters. Incredibly beautiful photos! Such a lovely destination . Wonderful to have the place to yourself, these wonderful photos benefit from the out of season peace. Now you’ve made me want to go somewhere and I can’t! Why so, Gilly? Ah, no matter how near or far you go, you always get a kick out of something anyways. Then you gonna love it here. I noticed Corfu having so many friendly seniors in every corner. They are lovely and approachable. Such vivid captures, Rommel. Thank you. I can now see how Corfu differs so from the rest of Greece. Here’s to your returning some summer! Corfu is still Greek but definitely very distinguishable from the rest. I’m here in Japan now so I’ll just dream about Summer in Greece for now. Love it Rommel. Another one on my list to visit. I wish I had made an effort to visit while I was in Naxos 2011. Great shots. Thanks! It’s always hard to decide which Greece destination to go to. I’m sure Naxos was still a great choice. Thanks for the compliment. I can’t pick a favorite photo. All are just awesome. That captivating charm! Hahaha! Good idea. I choose that then. I wonder how warm the water is. It looks delightful! Your pictures tell so many stories. The picture of the boat in the vast sea looks great! Quite a specific mention on that pic. Thanks for the feedback. 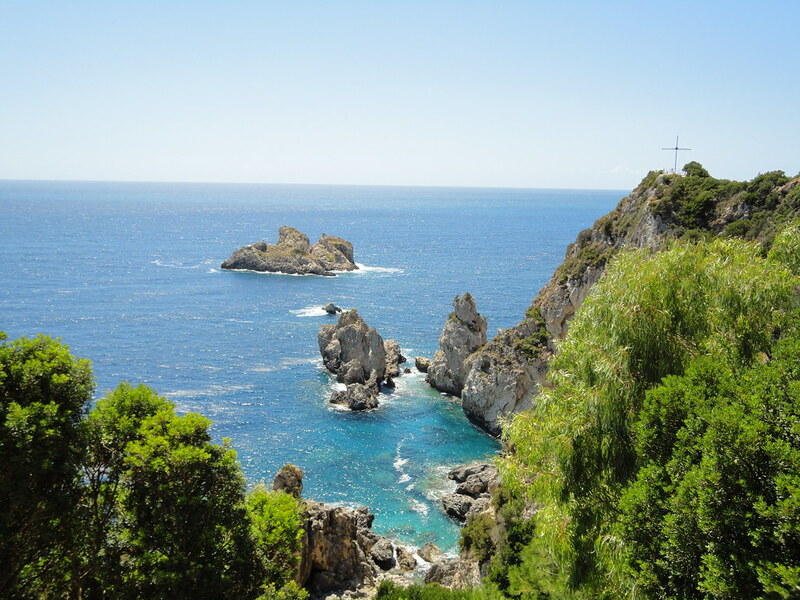 I loved Corfu…and it truly is a charming place! Corfu was a highlight of my entire Greece experience. The destination calls for artsy captures so… 😀 Thanks for the compliment. Corfu looks like a great place to hang ~ a bit of Greece and then as you say a feel of Europe. The photo you captured of the sea and of the fisherman taking up just a small space of this vastness is incredible…a feeling of serenity with this shot 🙂 Enjoy your travels. Absolutely. It’s a place to really relax esp. having just gone from Athens and Thessaloniki. Absolutely remarkable shots, Rommel. You captured the vistas so beautifully. Great photos , thank you for reminding me my home ♡ Greece is a place to be loved and i suggest you visit next year Mylos island ! Trust me you haven’t seen waters like this!